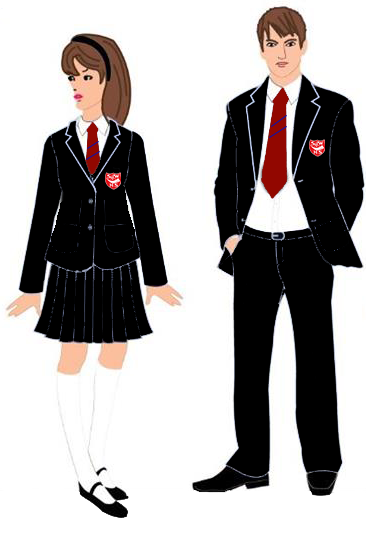 School ties and badges can be purchased from the school office throughout the year. Skirts must be school skirts and not be too short, tight, clingy or fashion skirts etc. Trousers must be school trousers. Jeans, fashion trousers, leggings etc. are not acceptable. No knitwear or sweatshirts etc. at all. NO jewellery except one stud per ear and a watch is allowed. Hair accessories should be in the school colours of black, red or white. Hair cuts and styles must be sensible. Hair extensions or shaved heads are not permitted. Hair dyeing in multi colours is not permitted. Red rugby shirt or plain red t-shirt, black shorts, black football socks and training shoes and football boots. White t-shirt/polo shirt, black shorts or tracksuit bottoms, training shoes and black jumper. Plain black tracksuit bottoms and sweatshirt are optional – no logos. A black sweatshirt for PE use only with an embroidered school logo is available for boys and girls. Students who study Dance are also to wear suitable PE kit.